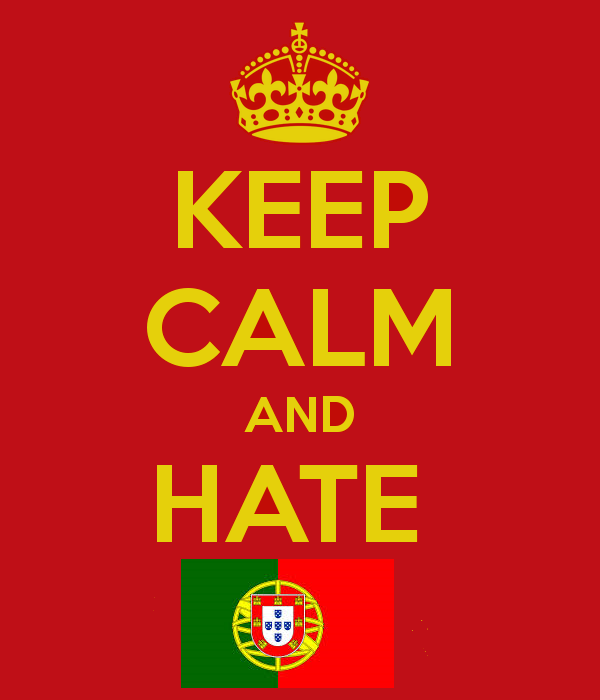 Funny...everywhere you look on the world wide web you always see the Keep Calm and Hate Brazil, Spain, France, America etc. banners but you never see one for Portugal (Truly the Biggest Racists and Haters on the Planet!). With this in mind, here is a much deserved and long overdue banner for the Portuguese. In 2016 the very Corrupt soccer organization known as FIFA gave Portugal a FREE-RIDE to their first ever European Cup! Normally, teams qualify by Winning games via legitimate means, unlike Portugal, who tied games with the help of the FIFA backed corrupt referees. Not to mention that most of their team is based on players from their former colonies of Brazil, Angola, Mozambique, Cape Verde, Guinea-Bissau and so forth. IF it were not for these out-of-country players given Portuguese passports there would NEVER have been a Portugee soccer team in the first place! Portugués Dormido Com Cu Perdido! There are many Portuguese sayings about other cultures (usually against their Former Colonies, Spain, and assorted Racist sayings toward everybody else on the Planet) but here are some of my absolute Favorites that make Fun of these Portugee just to be fair. Ask yourselves that! Google (Blogger and Youtube) need to STOP being complicit in Portuguese RACIST/XENOPHOBIC doings on their platforms yet do NOTHING about it. WHY is that Google? The Portugese and Google are like the Pot calling the Kettle Black - HIPOCRITES! PORTUGAL: THE QUIETEST CATASTROPHE IN GLOBAL ECONOMIC MEMORY! BRASILEIROS ... NAO VENHAM PARA PORTUGAL! PORTUGAL: POBREZA E SOPA DOS POBRES TODOS OS DIAS, E VERDADE! The information presented herein is based on compiled third party facts within the World Wide Web. They do not represent the ideas, writings or opinions of the Webmaster, or blog holder, etc. Thus, we are not liable for any damages incurred whatsoever during or after reading said materials. Do NOT shoot the Messenger, and read information at your own risk since this is HOW Portugal is viewed by others on Earth who are also entitled to their own opinions like you are.